As I start day 2 of “100 Days of Making” my thoughts drift back to the little run down cottage that I showed you in yesterday’s post. I can’t help but think that it is the hopeless romantic within me that can’t help but look back at that little run down beauty and truly feel that “a dream is a wish your heart makes.” What I have learned through time is that this little beauty was merely a God wink for incredible things to come. Back then I had not yet heard of SQuire Rushnell and his FABULOUS God Wink books. I have seen God do some AMAZING things in my life, but finding that little cottage in the woods was just the beginning. Fast forward to 2010, when one sentence from a friend would change my life with respect to my creativity. “You have got to check out the blog Notes From a Cottage Industry. She reminds me so much of you.” At the time I did not even know what a blog was, even though I taught young adults courses in computer science, but blogging was not a topic one generally found in college curricula. Going to Tracey Buxton’s blog changed my life. It exposed me to a world of creatives that I had never known before. Though she lived on the west coast and I lived in the heart of the south, our stories and life experiences, our design tastes and love of creating led to a connection. Her blog would become a stepping stone, introducing me to others. I was inspired, because in seeing their creativity come to light on the World Wide Web, it began to give this creative wings to explore what once I had only dreamed of doing. It was also at this time that I had discovered When God Winks at You, so I was keenly aware that this was no coincidence, God was indeed winking at me. 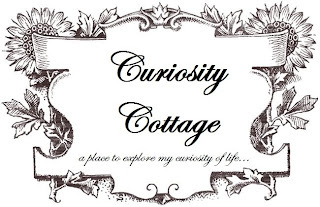 As I visited the blogs I began to pray, I began to seek and ask myself what I wanted to call my creative presence in the world, and it was through this quite time of reflection and prayer that the name Curiosity Cottage came to me. Curiosity Cottage is indeed my place to explore my curiosity of life because I have been doing this for as long as I can remember. I began to read and study other blogs drawing upon my technical skills and combining them with my creative skills. What I learned along the way is that technology and creativity really are a match made in heaven. Hey, it is February after all, so to find two things that love each other and work so well together seems only fitting. To view other sites and study how they put together everything from their page design; to the camera’s they use to photograph their images; and the software that they use for their image editing have all been a part of my creative process. Have there been road blocks and detours, most certainly yes. Have these bumps in the road hampered my creativity? Well sometimes life makes us put things on hold, but ultimately the bumps and bruises in life are actually what enable us to have a deeper appreciation of life. They help mold us and make us – these places on the maps of our life shape us into the creatives that we become. Going from point A to point B sometimes just takes us a little longer than we originally expected. The key is to take a deep breath and just enjoy the ride. Many years ago I had a dream & now it is time for that dream to become a reality. I’ll see you tomorrow!! Yes Tracey we are truly kindred spirits. And our styles are so much alike you would think we were related. :) You helped open doors to a world I never knew, but that has been such a blessing in my life!! Thank you! !